Visit the hidden gems of Pienza, Montepulciano and the Val D’Orcia in this full day excursion in Tuscany with an Italy’s Best driver. Pienza, a UNESCO World Heritage site, is rarely frequented by tourists, and you with experience this hidden Tuscan gem on your Pienza tour. Florentine Renaissance architect Bernardo Rossellino created Pienza for Pope Pius II, and the stunning architecture evokes a movie set. Filmmakers seem to agree as Pienza served as a location for “The English Patient” and “Romeo & Juliet.” Visit the Museo Diocesano and the Duomo for fine Sienese art then see Palazzo Piccolimini the Pope’s family palace with a design inspired by that of Alberti’s for Florence’s Palazzo Ruccellai. You’ll notice the distinct smell of pecorino, or sheep’s milk cheese, as you make your way around town. The cheese is produced nearby and sold in Pienza’s many artisan food shops. For years, the Florentines and Sienese fought over Montepulciano, the capital of the Val d’Orcia region and perched atop a narrow ridge of limestone, sitting close to 2000 feet above sea level. Montepulciano eventually went to the Florentines and their influences are found in the stately Renaissance architecture that lines the streets. 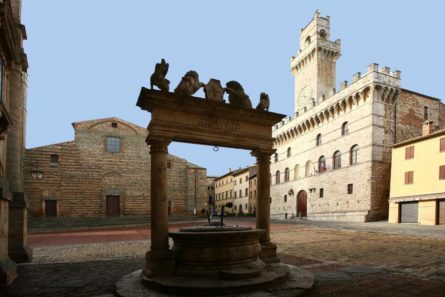 Your private guide from Italy’s Best will lead the way showing you the Michelozzo designed town hall, reminiscent of Florence’s Palazzo Vecchio as well as explaining the crucial role wine-making has played in Montepulciano’s history as its known for Vino Nobile di Montepulciano, a great Tuscan red produced nearby. Feel free to pick up a bottle or two in of the towns many wine shops that dot the streets before meeting your driver to return to your accomodations. This is just an example of our Val D’Orcia, Pienza and Montepulciano tour. For different pick up/ drop off locations or customized itineraries we invite you to contact one of our tour coordinators to help you design your own tour. Enjoy this exclusive ride in a Ferrari on a track typically reserved for Formula 1 race drivers. In Maranello you’ll also tour the Fiorano factory. You have a choice to visit Sorrento, Amalfi, or Ravello during this Amalfi Coast shore excursion along this UNESCO world heritage site. You will be driven along the world’s most breathtaking coastline, the Amalfi Coast, and choose where to stop en route. Enjoy this day trip to Chianti with kids. Children will be charmed by the Frescobaldi castle. Kids learn about life on the farm while parents taste wine. Embrace the Italian family tradition of local and authentic cuisine with your own family in a day trip to Chianti. This Chianti shore excursion from Livorno includes a wine tasting and full exploration of the Tuscan countryside, including a winery visit. This luxury Rome to Siena sightseeing transfer ends in Florence with a affords you a long stop in Siena to explore this spectacular Tuscan town. During this Cinque Terre day trip from Florence you will visit some of its most spectacular villages and enjoy a lunch of local specialties. This full-day Paestum tour and mozzarella cheese factory visit combines an archeological visit with a foodie twist in the company of experts. Participate in a private pizza making lesson in Tuscany before strolling the historic hill towns of Pienza and Montepulciano. Enjoy this exclusive, private full-day culinary tour in Tuscany. Visit Panzano for a traditional Tuscan lunch, see a cheese-maker at work, & visit a winery. Italy’s Best takes you to quintessential Tuscany on a private Siena & San Gimignano tour. View the rolling hills of Tuscany & these romantic hill top towns.